In most situations anodized aluminum window frames should not be painted. Typically the only time we recommend painting anodized frames is when the anodized coating is pitted, and is allowing corrosion to form on the surface; corrosion that once removed, is unacceptable. If you can live with the pitting once the surface is restored, an invisible protective coating can be applied in order to help prevent further deterioration of the aluminum. 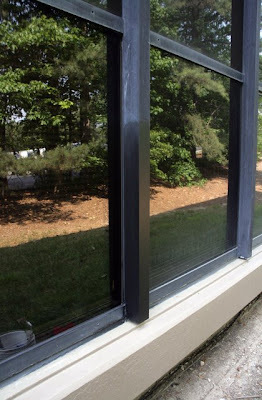 Most of the time anodized aluminum window frames can be restored using EnviRestore Metal Stain Remover or Metal ReSurfacer and a white non abrasive synthetic pad. Either of these products remove surface staining in order to reveal the durable anodized aluminum window frame surface. Both products utilize abrasive and chemical technology in order to restore the surface; However, the abrasive particles are small enough that you cannot view the scratches they produce with the naked eye. The anodized aluminum coating on window frames is an extremely durable surface, and can last for a long time in most situations; especially if installed and cared for properly. Products can be used to protect the anodized aluminum window frames and to prevent damage. Metal Protector MD is one such product, which installs an invisible, high performance, silicone coating to the surface. This coating helps to prevent damage due to contact with water and salts in the environment. The Metal Protector HD installs a thick acrylic coating, creating a glossy look; However, it will need to be reapplied approximately every 5 years, similar to paint. If you do decide to paint anodized aluminum window frames, maintenance will be required every couple of years when the paint starts to break down. Loose paint will need to be removed, and the surface will need to be repainted. If a decision is made to paint anodized aluminum window frames, it is important to use a high performance coating that will last for as long as possible. Typically more expensive industrial type coatings will cost more money, but they may last for up to 20 years.